BUGI takes an interdisciplinary look at the food system, using urban agriculture as a starting point. We will use various approaches to examine the numerous elements and dynamics of food systems, and we will focus on the role that urban agriculture can play in improving or supplementing this system. Because this course is in the Environmental Science, Policy and Management department, we will often invoke an environmental lens to explore how the process of growing, harvesting, delivering, preparing, eating, and disposing of food interacts with people and the environment. This class frequently goes on field trips to visit bay area gardens or project and often has guest speakers. There is also a required 2-hour internship commitment per week, which the student will schedule for outside of class. These internship hours represent a service-learning approach to exploring the food system. Students can choose any urban garden or farm in the Bay Area to complete their hours at. 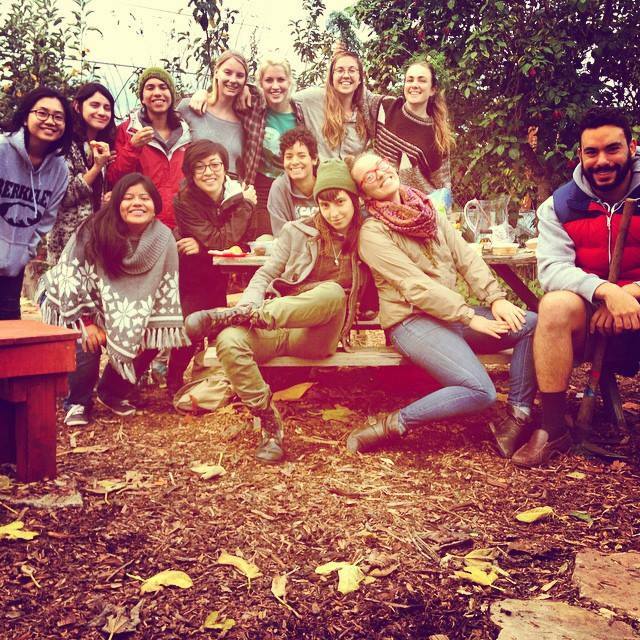 Garden Leadership and Management is a project based class that will lead you through the steps of executing meaningful projects within the Berkeley community- this could take place in our garden, in other local gardens, environmental communities or even online. Current garden managers will help interested students make a difference in their community through initiative, creativity and leadership. On Campus Gardening is taking back the green on campus! Help implement and maintain edible landscapes on campus. Yummm. This is our largest class, typically hosting over 150 students! Students will start their own garden bed in the garden and tend to it from start to finish. This course has been redesigned to introduce both new and experienced gardeners to the basic theories and methods of urban agriculture, while exploring the ways that social injustice and inequality determine everything from our access to food to our relationship with the non-human world to environmental health. In our class, we hope to inspire students to engage with these social issues, hopefully through growing food, horticulture, compost, design, and many more. People of all skill levels and of all majors are welcome, whether you grow all your own food or have a tough time keeping a cactus alive. As long as you’re willing to get your hands a bit dirty, this is your chance to learn and practice some basic organic gardening techniques. After taking this class, a student should have the knowledge and experience to plan, plant, and care for their own garden using organic practices, meaning without the use of synthetic chemical fertilizers or pesticides. Topics covered in the course will include plant propagation, soil, compost, and pest control to name a few. In the past, topics such as medicinal herbs, seed saving, and fruit tree pruning have been included, although we will shape our curriculum holistically according to student interest.